Tonight, MFT will be releasing 2 new sets: Ride em Cowgirl (new mini set) and Punch a Bunch. Here are a couple samples featuring these sets. I absolutely love the way this card turned out. The body was stamped on different coordinating patterned papers from K&Company Classic K Bailey Mat Pad and pieced together. Background watercolored and sponged. Hemp Twine is just the perfect accent for this style. 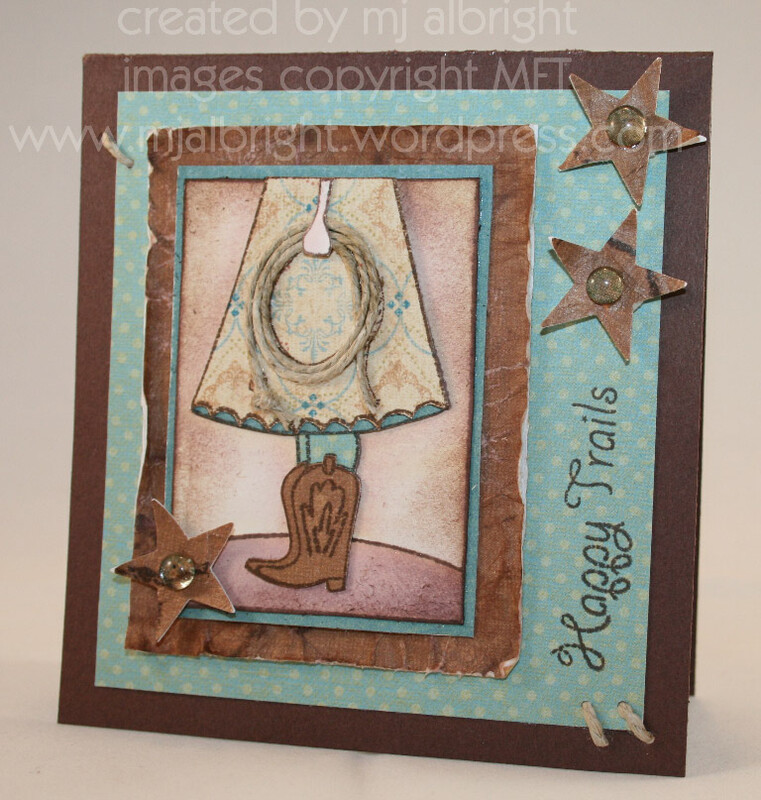 Added Cowboy Dew Drops that you can purchase at Ellen Hutson’s site. Here is a Gate-fold card that I used my Scor-Pal on. This card took some time to make. I used an exacto-knife to cut out the inner panels and adhered sponged strips of CS….gesh!!! I used Prismacolor Pencils on this one. This is my latest addition to my supplies. Lastly, I used Punch a Bunch set for this one. This set is really cute. I have one card to share with you at the moment. It is a great set for creating cards under 10 minutes (yes…I do know what that is). The middle flowers are cut out and adhered with mini glue dots just to add a little dimension to the card. This set is made to coordinate with Marvy Uchida Oval Scallop Punches (purple and pink)….or nestabilities would work as well. Now that I have shared some samples of the new releases, you can join us tonight on the MFT forum on SCS for a release cocktail party. Hope to see you there. Your samples are beautiful MJ! The cowgirl is a MUST have! The scalloped one sounds wonderful too and I’ll be getting it as well! It will be nice to pull out those Marvy punches again!! Hope to make the party at some point tonight! Gorgeous MJ!!! You are the reason I am now hooked on MFT’s stamps! I only wish I could color and shade as well as you do:( Your work is stunning. LOVE it!!! These are all so cute! Love the colors on the first one, and your gate-fold saloon door is just the cutest thing ever!! Well done! oh my cuteness!!! These are all fabtastic! I am particularly diggin’ the saloon doors! the sallon doors are too cute. great idea. you always come up with the cutest ideas! WOW! I love your saloon doors, too stinkin’ cute! well, of course the other cards are fabulous too, I wonder if your cards when you FIRST started stamping were just as good as now!? I know mine weren’t! WOW! Love your artwork & creativity! Gorgeous! I love the saloon one! So cute! Love the salon doors and the twine as rope! Hope things are going well for you! wow, love all your cards. The gatefold with the saloon doors is just amazing!! O M G! You are a genius! That saloon door card is just AWESOME! The other two are great too! SUPER JOB! WOW Mary-Jo, these are amazing! You should win a prize for that gatefold card…it is totally cool! And the punch a bunch design…love it, so sweet and pretty, love what you did with those flower on a horizontal oval! Holy Cow….I am still in awe of your saloon doors. That had to have been really, really time consuming. Awesome job!!!! gosh, Mary Jo, you have just outdone yourself on these beauties! outstanding and so very pretty to just sit and stare at! okay, now I sound like a stalker! 😀 but really, these are something else! I may have some of the same supplies, but there is NO WAY I could come up with the same end result! May Jo…all these cards are AWESOMELY CUTE…anyone would love to receive. I really like how you recreated the saloon doors…just to clever. Wow, my fav has to be the first one, I so Love the pp for the dress, the whole card just feels like it could be out of a western movie, LOVE it! Can’t believe the work that must have went into the gatefold card, just amazing. Love the dimension in the flowers, very sweet! 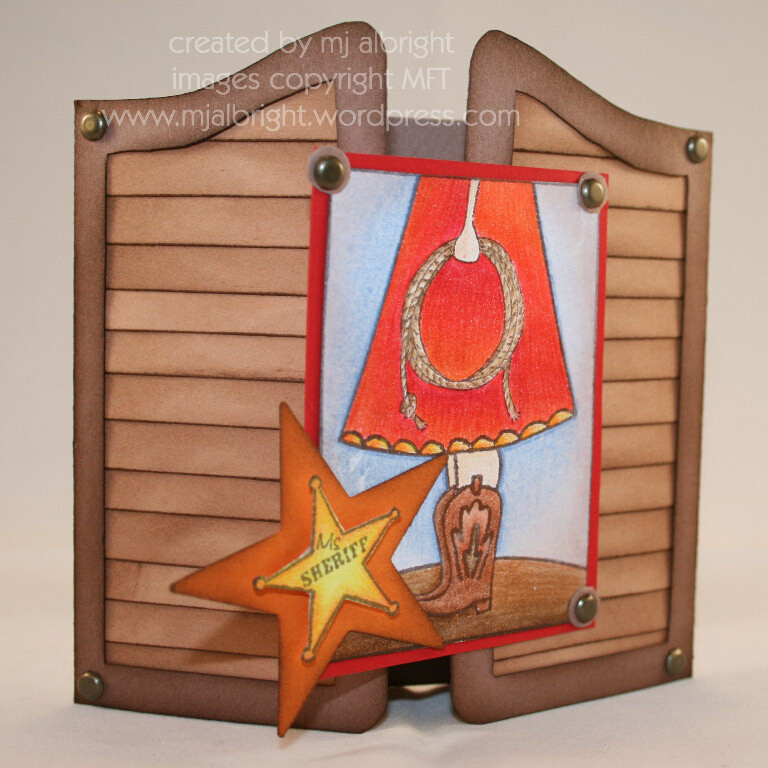 Love these cowgirl cards! The first one is my fave, but that swingin’ door—so creative! Love, love, love the saloon doors! WOWEE!! These babies are the BOMB!! WOW! I especially am lovin’ the 2nd one with the ‘doors’….it is STELLAR!! Way to go girl! These are all so nice but I love the third card. It is just so pretty. I am so in love with that Thanks a Bunch card on this post. I really need to just bite the bullet and get that set already! I love how you did the ribbon. I may have to case you on that!